Artist's rendering of the Peruvian Navy’s BAP Carrasco oceanographic research vessel. Image courtesy of General Electric. The BAP Carrasco oceanographic research vessel was christened in May 2016. Image courtesy of Navy of Peru. Total endurance time of the BAP Carrasco vessel is 51 hours. Image courtesy of Navy of Peru. The BAP Carrasco can sail at a maximum speed of 16kt. Image courtesy of Navy of Peru. A contract for the construction of the BAP Carrasco research vessel was signed in December 2016. Image courtesy of Navy of Peru. 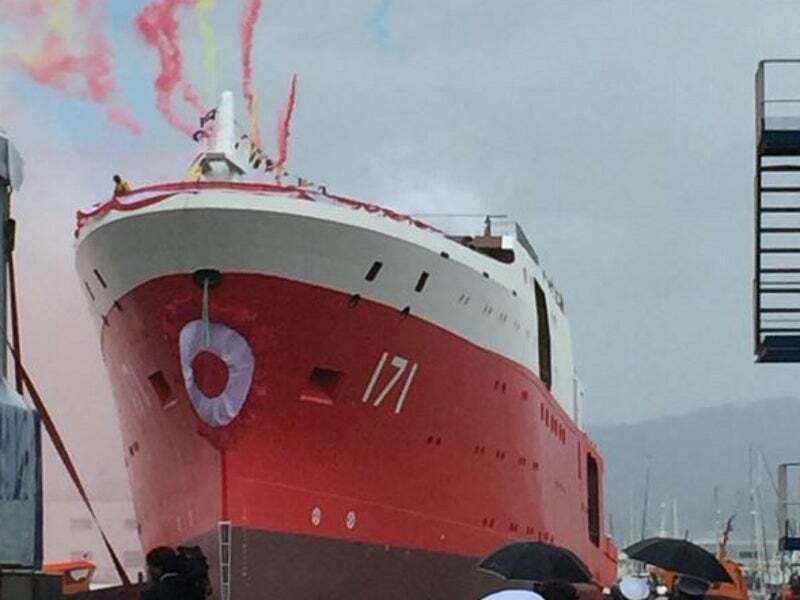 Designed to perform oceanographic research activities in Peruvian waters in the fields of hydrography, biology, geology, oceanology, geophysics, and meteorology, BOP-171 will help Peru to strengthen its scientific research capabilities in Antarctica. In addition to the research missions, BAP Carrasco can also be used in rescue, humanitarian and logistics support missions. The Ministry of Defence of Peru awarded a contract to Freire Shipyard in December 2014 to build an oceanographic research vessel for the Peruvian Navy. GE’s Marine Solutions unit was contracted by Freire Shipyard in April 2016 to supply marine solutions to the vessel. Kongsberg Maritime, in collaboration with Simrad Spain SI and Robinson Marine Electronics, supplied autonomous underwater vehicles and subsea technology systems for the vessel. The 95.3m-long and 18m-wide BAP Carrasco oceanographic research vessel can carry 50 crew members and up to 60 scientists to conduct sampling and inspection of water and seabed. It is operated and controlled from the enclosed bridge, located amidships. The vessel is equipped a hangar and a flight deck at the stern to support the operation of one helicopter. It accommodates scientific equipment storage warehouses, and laboratories for oceanographic and meteorological observations. GE’s SeaStreamTM Dynamic Positioning (DP) and automation system placed in the bridge provides the vessel operators with enhanced situational awareness. The computer-controlled SeaStream DP system maintains the vessel’s position by automatically controlling its propellers and thrusters using sensor data. The oceanographic and polar research vessel incorporates a variety of sensors to determine temperature, currents, conductivity and multi-beam bathymetry. The antennae placed on the top of the bridge are intended for navigation and communication. Kongsberg’s HiPAP (high-precision acoustic positioning system) is used to obtain the position accuracy in deep waters. It features one transducer, mounted atop the bridge, and one subsea transponder installed on the seabed. The vessel carries two HUGIN autonomous underwater vehicles, developed by Kongsberg, in hydrographic, geology and geophysics configurations. The vehicles are deployed from the stern of the vessel to conduct surveys at a maximum operating depth of 3km. The aft section houses a remotely-operated vehicle, which is capable of conducting surveys at a maximum operating depth of 1km. The vessel is also installed with other Kongsberg’s technologies including EM122 deepwater multi-beam echo sounder, EA600 hydrographic single beam echo sounder with frequencies 12kHz, 38kHz and 200kHz, Simrad EK80 single-beam echo sounder with multiple frequencies of 18kHz to 200kHz, and SBP 120 sub-bottom profiler. The BAP Carrasco polar research vessel is powered by GE Marine Solutions unit’s low-voltage electric propulsion system, consisting of MV3000 variable frequency drives, generators, anti-vibration motors, and switchboard. "In addition to the research missions, BAP Carrasco can also be used in rescue, humanitarian and logistics support missions." The diesel-electric propulsion system will help attain DNV GL’s Silent-A Class notation for underwater noise emission, while providing fuel efficiency. The vessel is also equipped with Rolls Royce azimuth thrusters. The cruising and maximum speeds of the BAP Carrasco research vessel are 12kt and 16kt respectively. With the ability to endure for 51 days, the vessel offers reliable operation with minimal environmental impact in difficult environmental conditions.